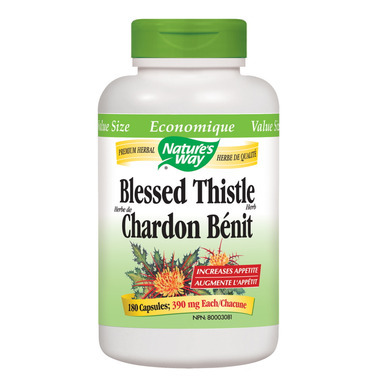 Blessed Thistle has traditionally been used in European tonics for digestion, appetite support and feminine health. Directions: Adults: Take four capsules three times daily with water at mealtimes. For prolonged use, consult a health care practitioner. Warning: Consult a health care practitioner prior to use if you are breastfeeding. Contra-Indications: Do not use if you have hypersensitivity to plants of the Asteraceae/Compositae (daisy) family. Do not use if you are pregnant. Known Adverse Reaction(s): Hypersensitivity/allergy is known to occur, in which case, discontinue use. Like all the other reviews works in conjunction with fenugreek. It gave me slight indigestion in the beginning but gets better with repeated use. I also noticed an increase in appetite but great to increase milk supply. I absolutely love this product. I have used it, along with the fenugreek, for all 3 of my babies and it has greatly helped my milk supply. Definitely recommend. Very goos to increase my milk mix wirh fenugreel, notice a difference when i forgot taking them for a day. Fenugreek & blessed thistle work wonders for my milk production since I'm breastfeeding. The price on well. Ca is so great plus free shipping! I won't buy this anywhere else! Chose to order this supplement from Well.ca as it was priced significantly better here than at my local health food store (price is very important when you have to take it in large quantities like this). I used it to help boost my milk supply for breastfeeding my infant daughter. Pair with Fenugreek and it worked wonders! Works well with Fenugreek for increasing milk supply. Much better price than at my local health food store.